Recently, we asked our followers a question: What is the one piece of advice you’d give to someone who’s moving house with a dog? We’ve already discussed how to go about this with cats, but dogs have a completely different nature, so the advice is completely different. One thing remains the same, though: moving house can be very stressful for everyone involved, and that includes the pets. FINDING ACCOMMODATION. If at all possible, try leaving your dog in a kennel or with a family member or friend while you’re moving. MAKE SURE EVERYTHING IS SAFE AND SECURE. When you reach your new house, you’ll want to make sure it’s completely secure before letting your dog off their leash. The last thing you need right now is a prison break! TAKE TIME OFF WORK. If at all possible, taking time off work makes a calm, happy move way easier. Your dog will be stressed out by the move, and having you around will be really soothing. UPDATE PERSONAL DETAILS. 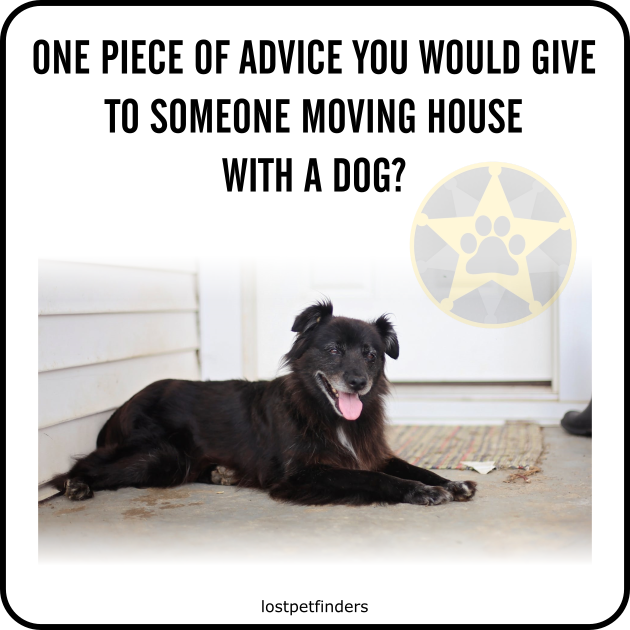 If the worst happens and your dog does go missing during the move, they’ll need the right information to find their way home. CONSIDER KEEPING INDOORS. As much as your dog may enjoy running around the garden on a normal day, we’d strongly encourage you to keep your dog inside at all times, at least for the first few days in your new home. The move may seem daunting, but that’s really all there is to it. So long as you use your common sense, it’s pretty likely things will go just fine! “Keep him close till he gets used to his new surroundings,” adds Joanne Kearney (VIC). SET UP THEIR SPOT. Once you’ve established your dog’s new personal space - complete with their old favourite bed and toys - it’ll be much easier for them to get settled in. Finally, thanks once again to everyone in the Lost Pet Finders community who shared their tips to help us put this guide together!